Compressors, fans, and blowers contain a multitude of moving parts. These moving parts have different types of motion such as translation, rotation, and various combinations of the two. To simulate this complex motion, CONVERGE generates the mesh automatically via optimized algorithms at each time-step to easily accommodate even complex motion within these machines. The new mesh is always Cartesian and the cells are not deformed, which improves the accuracy and speed of your CFD workflow. Automated mesh generation in CONVERGE means that you can simulate any type of design—CONVERGE will automatically generate a mesh to accommodate the geometry. This powerful feature makes prototyping straightforward, regardless of how many different designs you wish to simulate. The working fluid within these machines is often far from an ideal gas, making the ideal gas equation of state a poor model. One alternative is to draw properties from a user-defined model. CONVERGE includes multiple equations of state and allows for user-defined property relations for quick and accurate modeling of these non-ideal gases. It is important to capture the fluid-structure interactions that occur between the bulk flow and plate, reed, and ball valves in these machines to predict impact velocity, fatigue, and failure points. CONVERGE includes rigid body fluid-structure interaction (FSI) modeling to capture these phenomena. As part of its FSI model, CONVERGE includes a 1D beam model that is effective for predicting deformation of reed valves. The automatic mesh generation easily captures these interactions because CONVERGE recreates the mesh to accommodate the motion of the structures. Pressure waves that propagate through these devices can reduce efficiency, especially during the opening and closing of valves. You need to resolve the pressure waves in your CFD simulations in order to understand your system and then optimize your designs. CONVERGE has the tools you need to resolve pressure waves, including multiple techniques for controlling the time-step. Tracking the volumetric efficiency is an important step to optimize the efficiency of the machine. With CONVERGE, you can easily enable passive species as non-reacting tracers to track the movement of old and new gas during each cycle. CONVERGE’s genetic algorithm expedites the optimization of your geometry or other parameters. Some compressors have very tight clearances between moving parts. CONVERGE’s Adaptive Mesh Refinement (AMR) technology and boundary embedding feature (increased resolution associated with a particular boundary) help maintain resolution in these tight gaps, which improves the accuracy of the simulation. Again, as CONVERGE generates the mesh automatically, you simply set the criteria for mesh refinement and our algorithms do the rest. Resolving the spatially varying surface temperature distributions in these machines improves the accuracy of the simulation and provides useful temperature data. 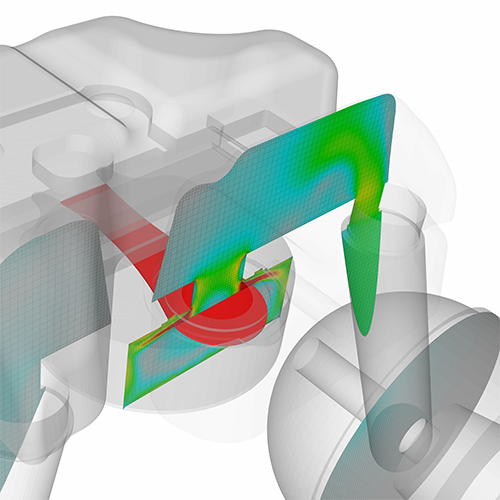 The conjugate heat transfer model in CONVERGE solves coupled fluid-solid heat transfer between the machinery and the working fluid to provide this resolution. CONVERGE includes a super-cycling feature that reduces computational time by accounting for the different time-scales between solid and fluid heat transfer. CONVERGE’s volume of fluid model allows you to capture oil splashing and other free surface flows that may be of interest. To model sprays, CONVERGE contains a robust suite of Lagrangian spray breakup models. No matter what physical process you’re interested in, CONVERGE’s Adaptive Mesh Refinement ensures that the mesh is both efficient as well as sufficient to capture phenomena of interest. Prediction of the surge phenomenon in dynamic compressors is important to understand the performance and limitations of these machines. CONVERGE was originally developed to simulate internal combustion engines, which inherently include transient phenomena, so the transient algorithms in CONVERGE are well-suited to performing the calculations necessary to resolve surge.